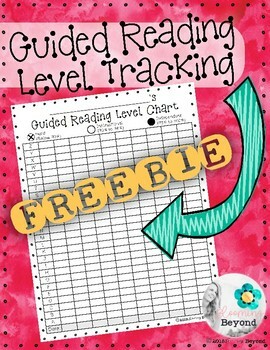 Student Guided Reading Level Tracking | Chart for Tracking Student Progress! 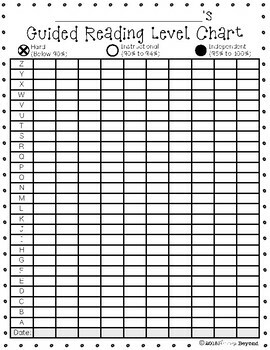 Use this freebie for tracking your students' guided reading level progress by simply jotting the date of assessment and using the key at the top to code their performance on a running record or Benchmark Assessment System. It is a great way to see your students' growth at a glance, whether it be for you, a student team meeting, or even for sharing with the child's parent/guardians at conferences, to name a few. Questions? Comments? Email me at bloomingbeyond@gmail.com. I sincerely hope you enjoy this free product. Please leave me a rating, I really appreciate your feedback! Copyright © 2018 Blooming Beyond. All rights reserved by author. Intended for single classroom/personal use ONLY, and should only be downloaded by the original owner. Copying for more than one teacher, classroom, department, school, or school system is prohibited. This product may not be distributed or displayed digitally for public view in any such manner. Failure to comply is a copyright infringement and a violation of the Digital Millennium Copyright Act (DMCA). Clip art, fonts, frames, backgrounds and any other elements found in this product are copyrighted and may not be extracted or used outside of this file without permission or license.